From prizewinning journalist and immigration expert Alfredo Corchado comes the sweeping story of the great Mexican migration from the late 1980s to today. When Alfredo Corchado moved to Philadelphia in 1987, he felt as if he was the only Mexican in the city. But in a restaurant called Tequilas, he connected with two other Mexican men and one Mexican American, all feeling similarly isolated. Over the next three decades, the four friends continued to meet, coming together over their shared Mexican roots and their love of tequila. One was a radical activist, another a restaurant/tequila entrepreneur, the third a lawyer/politician. Alfredo himself was a young reporter for the Wall Street Journal. 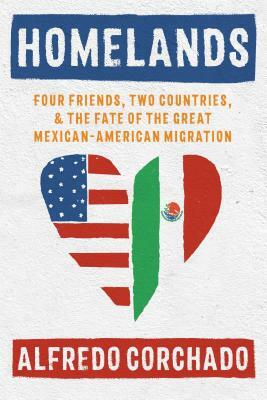 Homelands merges the political and the personal, telling the story of the last great Mexican migration through the eyes of four friends at a time when the Mexican population in the United States swelled from 700,000 people during the 1970s to more than 35 million people today. It is the narrative of the United States in a painful economic and political transition. As we move into a divisive, nativist new era of immigration politics, Homelands is a must-read to understand the past and future of the immigrant story in the United States, and the role of Mexicans in shaping America's history. A deeply moving book full of colorful characters searching for home, it is essential reading. "Corchado deftly interweaves his search for belonging with, for example, a sharp analysis of how NAFTA reshaped Mexico’s economy." - Texas Observer, naming Homelands one of "Our 10 Favorite Texas Books of 2018"